Disabling Bing in the Windows 10 taskbar apparently doesn't disable the Internet connection for desktop searches. By searching from the Windows 10 taskbar, users are making a connection to Microsoft whether they want to or not. 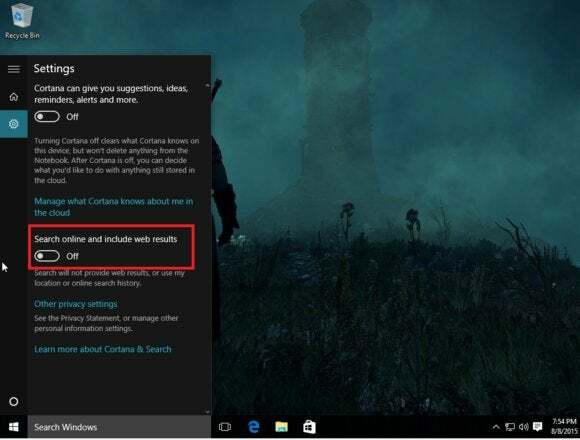 A report by Ars Technica found that even when users disable Cortana and Bing, taskbar searches still phone home to Microsoft and request a file from bing.com. The file apparently contains some Cortana information, and includes a random ID number that’s tied to the machine. When confronted with this information, Microsoft told Ars that it’s not receiving any query or search usage data. “As part of delivering Windows 10 as a service, updates may be delivered to provide ongoing new features to Bing search, such as new visual layouts, styles and search code,” the company said. Still, it’s unclear why Microsoft is providing those updates to users who’ve specifically asked to exclude Bing search from the taskbar, which can otherwise be used to find local files and apps. As Ars points out, it seems Microsoft is using these requests to download Live Tile information even if the user doesn’t have any tiles in the Start menu. And even when collection of telemetry data is disabled, some of the transmitted information appears to reference telemetry settings. Microsoft was also receiving some traffic whose purpose Ars couldn’t identify at all. In lieu of any clear explanation from Microsoft, or any way to disable these extra transmissions, users who are spooked by the prospect of more data collection will simply have to avoid using taskbar search. Fortunately, there are alternatives, such as Everything Search Engine. There’s also a free tool on Github that claims to disable some known methods of tracking in Windows 10, though we haven’t tested this ourselves. Why this matters: In recent years, Microsoft has tried to establish itself as a privacy leader that won’t cross the same creepiness lines as rival Google. It’s hard to say Windows 10 has advanced that goal, between the collection of typing data in the Technical Preview, the slightly unnerving Wi-Fi Sense feature, and the default collection of taskbar search data through Bing. The continued taskbar connection for people who disable Bing is a relatively minor offense, but it hardly instills trust at a time when Microsoft is trying to change the perception of Windows.